BD "Profile 1.1" enables "picture-in-picture" and secondary audio features for viewing director or actor commentary while the main movie is playing. The BDP-83 support BD "Profile 2.0&quopt; and contains all necessary hardware - audio/video decoder, Ethernet port, and 1GB of internal storage - for BD-Live. The BDP-83 uses the same VRS™ by Anchor Bay (DVDO) de-interlacing and scaling technology as in our award-winning DV-983H DVD player. The up-converted picture quality bridges the visual gap from your current DVD library to Blu-ray discs. The BDP-83 plays DVD-Audio and supports both stereo and multi-channel high resolution audio programs. Users can select whether to play the DVD-Audio or the DVD-Video portion of the disc. The BDP-83 plays Super Audio CD (SACD) and supports both stereo and multi-channel high resolution audio programs. Users can select whether to output the DSD (Direct Stream Digital) signal in its native format or convert it into PCM. Additional disc and file formats, such as audio CD, HDCD, Kodak Picture CD, AVCHD, MKV, and other audio/video/picture files on recorded discs or USB drives can be played back on the BDP-83. The BDP-83 incorporates Anchor Bay's award-winning Video Reference Series (VRS) technology, and delivers a picture that is cleaner, smoother, true-to-life and free of artifacts. The BDP-83 features user selectable video output resolutions, including 480i, 480p, 720p, 1080i, and up to 1080p 50 or 60Hz. Many Blu-ray Discs are recorded at 24 frames per second, the same frame rate as the original movie's theatrical release. The BDP-83 can faithfully redeliver the original frames using 1080p 24Hz output (compatible display required) for smoother motion and a flicker-free, film-like home theater experience. It can also restore the original 24 frames per second progressive-scan video from well-authored DVDs and output as 1080p 24Hz. For users who wish to use an external video processor, high-end audio/video receiver or display, the BDP-83 offers a "Source Direct" mode. The original audio/video content on the discs is sent out with no additional processing or alteration. The BDP-83 supports multiple levels of aspect ratio control and image zooming, including a vertical stretch mode for customers with a 2.35:1 CIH (Constant Image Height) display system. HDMI is an all digital interface for the cleanest possible connection. It delivers high-quality digital video and audio through a single cable. The BDP-83 features an HDMI v1.3 output with 30-bit and 36-bit Deep Color support. Dolby TrueHD delivers lossless studio master quality audio designed specifically for high definition entertainment. The BDP-83 supports bit-stream output of Dolby TrueHD via its HDMI 1.3 output. It can also internally decode Dolby TrueHD into LPCM and output via HDMI or the 7.1ch analog audio output terminals. (Dolby Digital and Dolby Digital Plus audio formats are also supported.). Individual analog 7.1-channel surround outputs are ideal to connect to a 7.1-channel or 5.1-channel surround sound system. The BDP-83 delivers an incredible sound stage and an immersive surround experience. The BDP-83 features a dedicated 2-channel analog output with specially optimized Digital-to-Analog Converters and output driving stage. 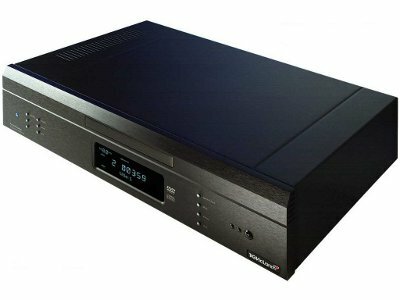 For simple and easy connection to more traditional A/V receivers, the BDP-83 features both optical and coaxial outputs for digital audio. The BDP-83 comes with a fully back-lit remote control for ease of use in dark home theaters. With its ergonomic button layout and clear labeling, operating the Blu-ray Disc player is easier than ever. The BDP-83 features a wide-range world power supply that is compatible with the AC power of all regions. No worries about damaging the player due to incorrect power voltage. For integration into home theater control systems, the BDP-83 provides external IR remote IN and OUT ports. For custom installation, the RS232 control option can be special-ordered at an additional cost.